Wear hats and beanies, particularly on bad hair days! Go to the theater or cinema, but theater is so much more fancy and you can dress up a bit more. Take long luxurious baths. If there is ever a time to make extra time for you on Sunday evenings then this is the time of the year for it. Wear colorful skirts with black tights and black tops. Drink sumptuous red wines. Put the prosecco and aperol spritz away and indulge in beautiful berry flavored red wines. Enjoy an indulgent cup of hot cocoa in the evening. With cinnamon and nutmeg. And whipped cream. Cook your favorite one-pot foods. It’s the time to put away those salads and pastas with light sauces and take out the crock-pots, the spices and make foods that cook for hours and are so rewarding in their wonderful sumptuousness. And then dunk the bread right in! Wear a bold lipstick and not to much else with the rest of your make up. Consider it a huge time saver for those mornings when it is just way too dark outside to wake up on time. Throw away your boring black umbrella and get one that will make you smile every time you open it. And open it you will! Buy a ridiculous pair of fluffy socks and wear them around the house. Plant some autumn and winter plants in your garden. It is not too late to enjoy some greenery. Wear boots. This is the time of the year to do it. Don’t wear them in summer, please (this last one I am sure will be understood by those of us who live in the Netherlands). Swap your pastel and light colored nail polishes for darker hues. Throw dinner parties! Move over barbecue, fall and winter are fancy dinner party times! Decorate your house, because hey Christmas is just around the corner! 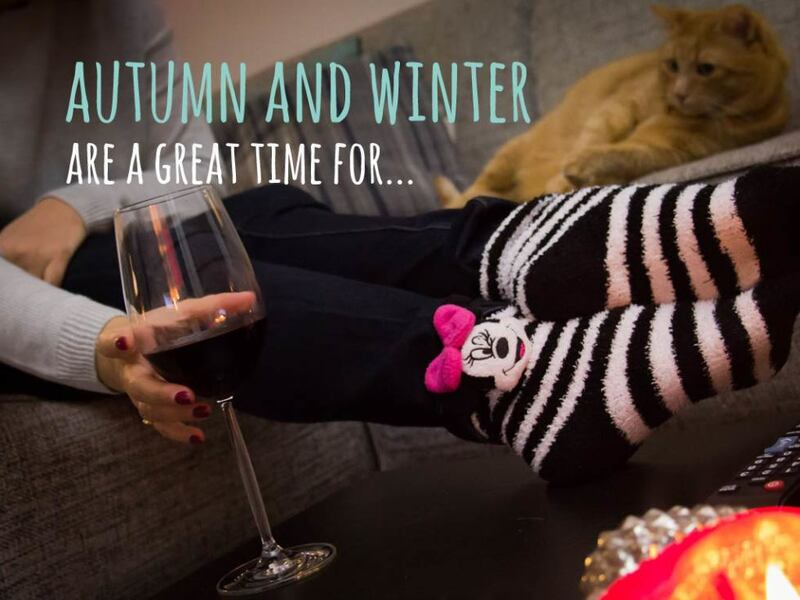 Let me know what your think that autumn and winter are a great time for! I’m going to the tehater tonight! I haven’t been in a while, so it’s exciting! Looking out my window I must say I wouldn’t mind swapping with you and your no season climate for a year or two!